Discover Pantherella in its all glory. 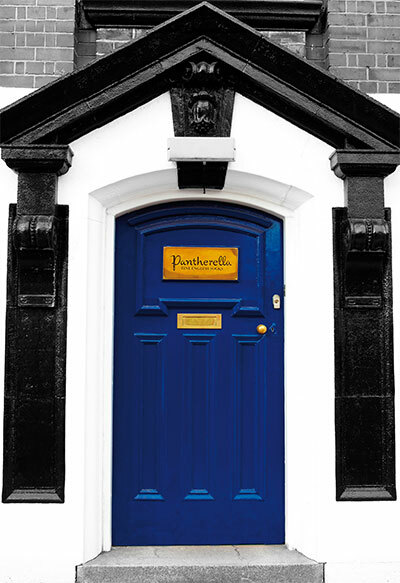 Take a look behind our famous blue door and find out what sets Pantherella socks apart from the competition. From the worlds most luxurious yarns to our highly skilled craftsmanship Pantherella socks are the worlds finest socks made in England since 1937. My name's Justin Hall. I'm a 5th generation sock maker and my family started making socks in 1882. Pantherella was started in 1937 by Louis Goldschmidt. He started his factory on Hallaton Street here in Leicester, England and we're still based on the same street to this day. Right from the very beginning, Pantherella established itself as a maker of fine English socks. We use a lot of modern machinery in making our socks, but it does mean we still use a lot of traditional techniques and processes. Every Pantherella sock is crafted by of our skilled team of sock makers. We've been making socks for generations. There's a real dedication to delivering quality and within the business there's generations of families who've worked here as well. Each pair of our socks is hand-finished to ensure they meet our highest quality standards. Things such as the smooth fine-linked toe seams that add extra comfort. We do reinforce heels and toes for added durability. These are skills that can take years to acquire. There's a lot of know-how with regards to using natural materials and natural fibres. We do use the best quality materials in the world. We have done for generations and we're continuing to do so. From the Cashmere to the Chinese Silk, provenance is important in everything that we do. And it takes many years to build up the experience to be able to work well with them and to know how to get the best out of them..
Each pair of socks has been passed through dozens of pairs of hands to ensure that every pair of Pantherella socks leaves with the Pantherella stamp of approval. This has been essential in growing the Pantherella name as the number one sock maker. We pay particular attention to international fashion trends and seasonal colours and we're producing new collections every season. Pantherella's reputation is acknowledged both here in England and abroad by many of the world's premium department stores and we've been stocked by Harrods since the 1940's and we've gained followers from style icons and aristocrats to Royals and some dapper dressers along the way. We make all the socks here, in our own factory in Leicester. We have control from the start to the finish to ensure that Pantherella socks remain the World's Finest.